What Is a Type Manifold? At a high level each of these features is classified as either a Type Manifold or an Extension via the Extension Manifold. Bridging the worlds of information and programming, type manifolds act as adapters to automatically connect schematized data sources with Java. More specifically, a type manifold transforms a data source into a data type directly accessible in your Java code eliminating code generation build steps involved with conventional tools. Additionally Manifold provides IDE integration to automatically keep types in sync with data sources as you make changes, again with no addtitional build steps. In essence with Manifold a data source is a data type. As with any resource file a properties file is foreign to Java’s type system – there is no direct, type-safe access to it. Instead you access it indirectly using boilerplate library code sprinkled with hard-coded strings. Concise and type-safe, with no additional build steps to engage. Almost any type of data source imaginable is a potential type manifold. These include resource files, schemas, query languages, database definitions, templates, spreadsheets, web services, and programming languages. The extension manifold is a special kind of type manifold that lets you augment existing Java classes including Java’s own runtime classes such as String. You can add new methods, annotations, and interfaces to any type your project uses. There’s a lot more to the extension manifold including structural interfaces, which are similar to interfaces in the Go language. We’ll cover more later in this guide. Manifold’s core technology is a dramatic departure from conventional Java tooling. There is no code generation step in the build, no extra .class files or .java files to manage, no annotation processors, and no extra class loaders to engage at runtime. Additionally, Manifold is just a JAR file you can drop into your existing project – you can begin using it incrementally without having to rewrite classes or conform to a new way of doing things. Using Manifold in your project is easy, but there are configuration details you should understand before you get going. Your project’s configuration of Manifold largely depends on which version of Java it uses, namely Java 8, Java 9 or later with modules, or Java 9 or later without modules. Please keep this in mind and read this section carefully. Note you can change the JDK to any Java release 8 - 12. But you need to make changes in the pom.xml file to make that work. There are notes in the pom.xml file to help with that. Read them carefully and maybe read the rest of this Setup section too. Don’t be shy with questions, comments, or complaints. We want all your feedback, good or bad! We use github issues to track feedback here. Or start a discussion on gitter. Also feel free to send email: info@manifold.systems. That’s basically it, however there are nuances with Java, Maven, Gradle, etc. to consider depending on the version of Java your project uses. Manifold fully supports Java releases 8 - 12 on all platforms, including Windows, Linux, and Mac. If you are using Java 9 or later with module-info files you must declare dependencies to the manifold jars you are using. Details concerning -processorpath configuration in Maven and Gradle are covered later in this section. If you are using Java 8 you may need to include tools.jar in your classpath (runtime only). Your project requires tools.jar if you are using Manifold in dynamic mode, as opposed to static mode. See Modes for details. Both modes operate lazily: a type is not compiled unless it is used. For example, if you are using the JSON manifold, only the JSON files you reference in your code will be processed and compiled. This means Manifold will not try to compile resources your project does not expect to use directly as types. Even if you use static mode, you can still reference type manifold classes dynamically e.g., reflectively. In such a case Manifold will dynamically compile the referenced class as if you were operating in dynamic mode. In general, your code will work regardless of the mode you’re using; Manifold will figure out what needs to be done. Dynamic mode requires tools.jar at runtime for Java 8. Note tools.jar may still be required with static mode, depending on the Manifold features you use. For example, structural interfaces requires tools.jar, regardless of mode. The JSON & YAML manifolds model both sample files and files conforming to JSON Schema as structural interfaces. Manifold is best experienced using IntelliJ IDEA. Use the manifold-all dependency as a simple way to use all of Manifold’s basic features. This is the recommended setup. 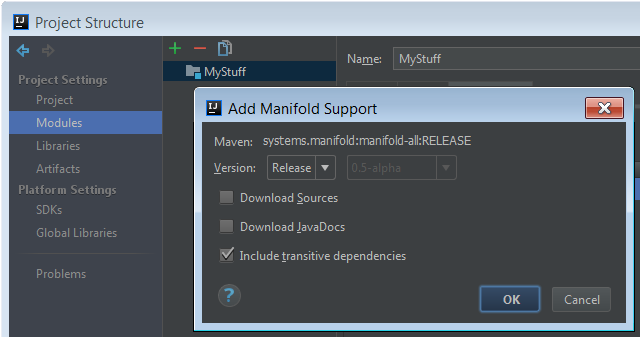 Configure the maven-compiler-plugin to use Manifold. Configure the maven-compiler-plugin use Manifold.